In everyday life wristwatches are subject to hard use, which unfortunately can make marks on the case. Damasko has set the goal of manufacturing watches which brave the perils of everyday life and serve as a time keeping instrument for years without acquiring marks to show the age of the watch or reveal the hard life of the owner. The Damest coating is another innovation to support this goal. The Damest coating protects the watch with its special structure, like no other coating, to maintain a new appearance. The special coating of Damest is a proprietary multi-layer composition. The foundation is the case material of martensitic stainless steel with a hardness of about 740 HV. This ensures a stable and impact-resistant base layer, which supports the upper layers and prevents them from breaking under stress. An intermediate zone about 1.5 µm (microns) thick is created by ion implantation on the surface of the case. This region is strong with hardness about 1500HV. It acts as a bonding layer between the case and the multi-layer coating. The coating layer adheres to this region and spalling is prevented. 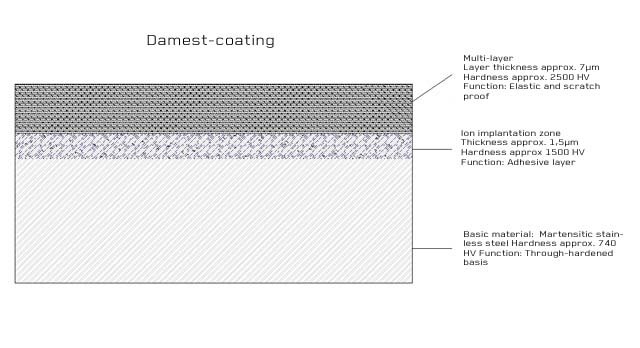 The Damest multi-layer coating is applied in a PECVD process. The combination of layers is about 7µm (microns) thick with an outer hardness about 2500HV to resist abrasion. Some of the intermediate layers of the coating have a certain elasticity. By keeping the layers thin, the outer layers can deflect enough to resist chipping from impact without enough deflection to crack. The result of this combination of layers is a hard coating with high resistance to scratching the surface. So, the watch can look new for years.